Ninety days of world travel complete, and by “world travel,” I of course mean flying to the first destination on my list and staying here the whole time. I've recorded every expense down to the last taco (not as difficult as you might think; I average just under three purchases per day). Using the exchange rate I receive at local ATMs – which hovers around 18 pesos to 1 dollar – here’s how I’ve fared so far against my monthly expense budget of $1,000. This includes my rent of $195 per month plus my first 3 nights in Mexico at an Airbnb in Sayulita (which almost equaled my subsequent monthly rent). Note to self / readers: never use Airbnb for long-term stays – it’s muy carro (very expensive). 'Various: 120 pesos.' "Thanks Paula...you know what, going forward, let's just forget about these receipts." Though this includes Nayarit bus fares, the bulk of my transportation cost was the $286 initial plane ticket. I benefited from not flying anywhere else in the quarter, though even if I did, I still would have come in under my $1,000 monthly expense budget. To anyone who thinks flights are prohibitively expensive, they’re not! Guess what this is. Exactly right! 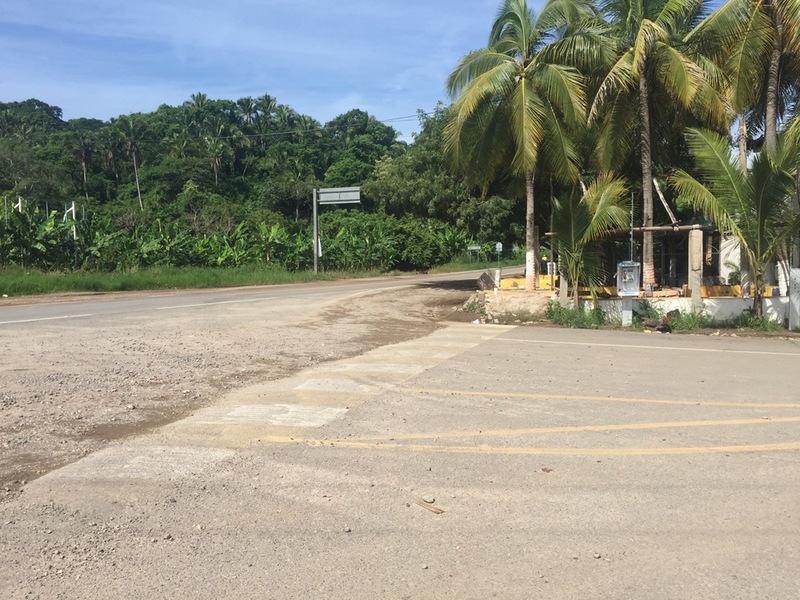 It's the crucero, the San Pancho "bus stop" right alongside the highway, referenced (but not pictured) in an earlier post. Surprisingly, nobody's there in this picture...you would see them under that tree. I wrote an earlier post on these, so I won’t bore you with redundant details here. Since then, though, I’ve begun supplementing my formal classes with informal conversational “lessons” from some of my tutorees. Nothing exciting to report here. Just the usual toothpaste, mouthwash, deodorant, soap, etc. A fruit stand I frequent, located on Calle American Latina. No toiletries here, but I already had the receipt photo in the "Food" section. This includes my gym membership (250 pesos per month, and the subject of a future blog post) and a couple yoga classes. This will be significantly lower going forward, since gym owner and friend Felipe waived all future gym fees after I started tutoring him in English a week ago. Paula, my landlord, gives my apartment a full cleaning every couple of weeks, which costs 220 pesos (200 pesos - $10 - plus a propina – tip). It’s amazing: all my dishes washed (granted, I only have one plate, one bowl, a pan, and some silverware), all floors mopped, sheets washed, items organized, and dust . . . um . . . dusted. My go-to grocery store. Pardon the truck. I guess I could've walked across the street and taken the picture...oh well. There’s a Laundromat on the next street over from my place, and I pay 45 pesos (a little more than $2) for them to wash and fold all my clothes. Sometimes we lose water here for extended periods of time, so it’s actually somewhat of a crapshoot as to whether they’ll be able to wash my clothes. "Please have water, please have water, please have water..."
That’s it! In a future post, I’ll detail my credit card / debit card / bank account setup. As a preview, I highly recommend the Schwab Debit Card to international travelers. No ATM fees ever, worldwide, with no exceptions. Schwab even managed to deliver a new card to me here in San Pancho; no small feat in a town where there’s NO mail service. More on that later. PS. Bonus points to those who recognized that the bars in the graph were shaded to look like Mexican flags.